Murdering babies has to stop! America is in the midst of a culture firefight with the recent announcement of President Trump’s nominee to the Supreme Court of the United States. Liberals are going ballistic and crying that women’s abortion "rights" are under attack. On the other side, conservatives are hopeful that if the nominee is confirmed, there might be a chance that Roe v. Wade could be overturned. You and I know that Roe v. Wade is an immoral ruling, which has been destroying this country’s moral fabric since 1973. Over 60,000,000 babies have been murdered since that infamous decision. That’s why we need to proclaim boldly and courageously that we want Roe v. Wade to be overturned and abortion to be made unthinkable. I want abortion to be unthinkable. Sign here to show you are pro-life! But for us to enter this new phase in the pro-life battle, we need Our Lady’s help. That is why we would like to take the names of all those who signed this pledge to Our Lady of Good Success in Quito, Ecuador. There, we will ask that Our Lady to bless all those who are pro-life and we can ask her to help us in the coming struggle. Imagine if America overturned Roe v. Wade! Think of the encouragement that would give all pro-lifers around the world. It would proclaim that truth always triumphs over evil. That’s what Our Lord Jesus Christ promised, didn’t He? Please proclaim your pro-life values. Take a stand now to defend innocent life and show that America wants the end of abortion—Period. For more information about the prophecies of Our Lady of Good Success about our times, click here. Please place my pledge before the statue of Our Lady of Good Success in Quito, Ecuador. 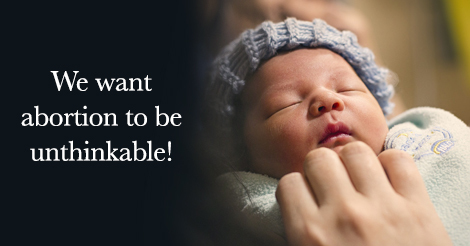 I am not afraid to proclaim my pro-life values and I want abortion to be unthinkable. Overturn Roe v. Wade NOW!